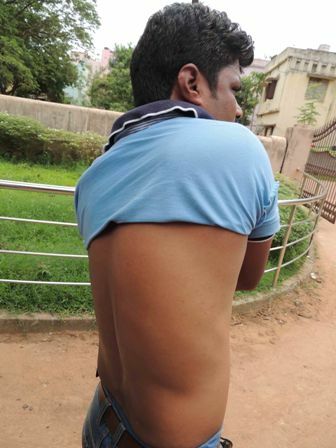 A photo journalist of a Odia daily “Samay” Jitendra kumar Mohanty was today severely assaulted by the associates of Ranjan Das, an accused of Swastik chit fund scam, at his residence–MB-83, Badagada Brit Colony in the capital city of Bhubaneswar. The incident happened today morning while Mohanty along with other journalists went to Das’ residence on the wake of CBI raid at the residence of Das, chairman of Swastik India Multi State Credit Cooperative, a chit fund company in the state. The CBI has today lunched massive raid simultaneously at 12 different places, including Das’ residence in Bhubaneswar, belonging to the company and its top executives across Odisha. “Ranjan Das and his associates attacked me, ETv reporter Subhrakanta Padhiary and other photo journalist Manoranjan Mishra while we were covering the CBI raid on his residence. As soon as we reached there, they thrashed us. I was dragged to Dash’s residence and assaulted for at least 20 minutes before the police came”, Mohanty said. An FIR has been launched against Das and other accused in this connection at Badagada police staion. Meanwhile Parliamentarians and Editors of “Samay” and “Dharitri” Shri Ranjib Biswal and Tathatgata Satapathy respectively reached the Badagada police station and condemned the attack on the scribes of the state .